Rod's Gutter Cleaning are specialist gutter cleaning company that operates in Nottingham, Derby, Loughborough and surrounding areas. We have the expertise to easily remove any unsightly material soiling your conservatory roof to restore it to it's "as good as new" appearance. If you would like further information about the services we provide then please get in touch. We offer you qualified and experienced staff who give their best delivery throughout their customer service with their clients. They are covered by public liability insurance and offer their clients extremely competitive prices,depending on the size and style of your property. Although gutter cleaning is our specialist area, we also provide a conservatory cleaning service. Depending on your needs we can clean just your conservatory roof or the service can be extended to include all the framework, windows and door of your conservatory. In addition to your conservatory, we can also clean your Soffits and Fascias, Car Ports & Greenhouse. Do your gutters need a good clean in Nottingham, Derby or Loughborough? Rod’s Gutter Cleaning is an established and specialist gutter cleaning company that operates in Nottingham, Derby, Loughborough and surrounding areas. Using the latest gutter cleaning equipment we are able to clean your gutters from the safety of the ground without the need for ladders or expensive scaffolding. 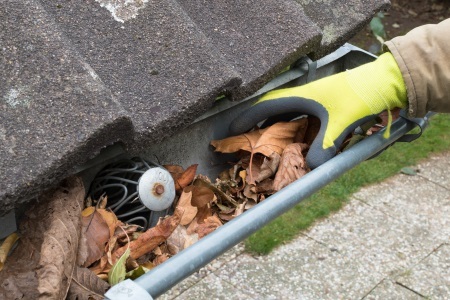 Our unique gutter cleaning equipment will ensure that your gutters are free from harmful blockages that could potentially lead to damp and other problems caused by water damage. At Rod’s Gutter Cleaning we are able to offer an annual, semi-annual, one off, or whatever service is required at an affordable price to suit your personal needs. Providing a gutter cleaning service throughout Nottingham, Derby & Loughborough, Rod’s Gutter Cleaning has an excellent reputation for quality service and is covered by public liability insurance for your peace of mind. As a highly recommended company to clean your gutters, we also clean conservatory roofs, conservatories, soffits, fascia’s, block paving and patios. Rod’s Gutter cleaning can help you with your external cleaning needs to give your home the sparkling appearance you deserve. Rod's Gutter Cleaning has recently been selected as one of the three best rated gutter cleaning companies in Nottingham. This analysis was based on a 50-point checklist including such factors as customer reviews, history, complaints, ratings, satisfaction, trust, cost and general excellence. For more information see https://threebestrated.co.uk/gutter-cleaner-in-nottingham. Where are our Gutter Cleaning services available? We are available to clean your gutters in Nottingham, Derby, Loughborough and surrounding areas. Rod’s Gutter Cleaning is willing to travel a distance of 15 miles from Long Eaton (NG10) so call us today, we can definitely help in making sure your guttering system is working efficiently and thus helping you to avoid unnecessarily high repair bills due to water damage. Get in touch with us today, if you require any more information on Rod’s Gutter Cleaning. Call us on 07837 834 462 or 0115 8491677.